I am always intrigued by award winning books. I’m interested to know what about them was special enough to make them stand out. Was it the story? Was the writing particularly amazing? I need to know. Unsurprisingly, I don’t love every single award-winning book I’ve ever read. But that doesn’t make me want to read them any less. Each year, the Pulitzer winners in particular catch my eye (I also follow the Man Booker fairly closely). 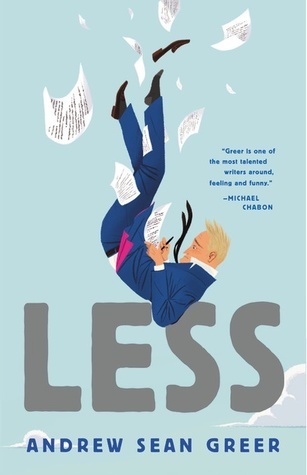 So, this year, I decided to read the newest winner pretty much right away: Less by Andrew Sean Greer. (From Goodreads) Who says you can’t run away from your problems? I had a bit of an interesting experience reading this book. I first tried to read it a few months ago, and just wasn’t feeling it. So, I did the smart thing and put it down. Then, earlier this month, I decided to give it another shot – as an audiobook. And it was definitely the right decision. Because the audiobook instantly hooked me. Lesson: if you’re not totally into a book, maybe give it a second try in a different format. It worked out well for me. Less is part travel diary, part satire, and part love story. And I really enjoyed it! It definitely surprised me. I didn’t exactly relate to the main character – I’m a twenty-something, straight woman and he’s a fifty-year-old gay man – but I loved him any way. He is tragic and funny and I just wanted to give him a hug. It was a lot of fun to follow him around the world on his ridiculous adventures. I can definitely see why this won the Pulitzer. It was impactful and relevant and incredibly smart. Granted, it might be a bit high-brow, but I personally really enjoyed all of the literary references. It was just a wonderfully crafted novel, and it made me really happy. If you’re a fan of literary fiction (or, like me, intrigued by award-winning books), I’d definitely recommend this one! ★★★★☆ – Was Less the most amazing book I’ve ever read? Probably not. But it was a good book that made me smile and reminded me what good literature is. Which is really all I want. Less is available in bookstores now! Pick up your copy on Amazon – the paperback is currently less than $7! To get the audiobook for free, use this link to sign up for a free trial of Audible and choose Less as one of your two free books. Obviously, I highly recommend it!